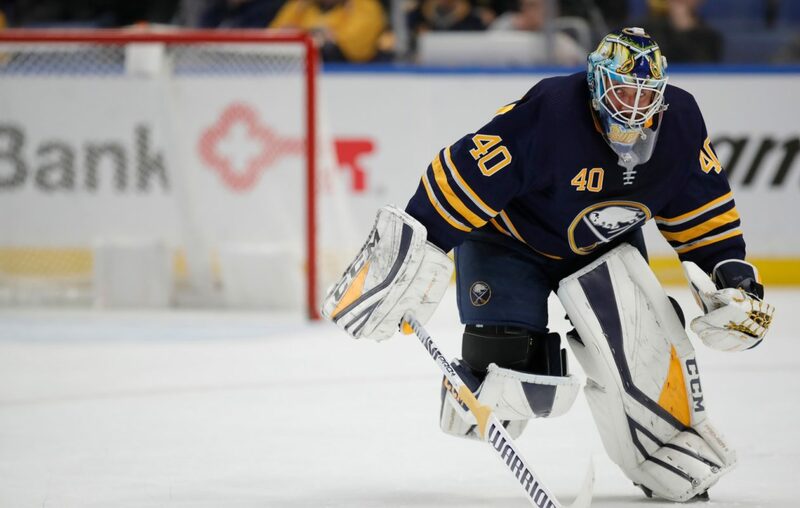 In the final days of an unpredictable season, Carter Hutton has not lost sight of why he chose to sign with the Buffalo Sabres. The 33-year-old goalie was free to join any NHL team last summer after an outstanding season in St. Louis and reportedly had offers from a few playoff contenders, including Boston. Yet, Hutton chose a three-year contract from the Sabres, who had just won only 25 games and had not qualified for the postseason since 2011. Buffalo presented a unique opportunity for him to play more and potentially help turn around a struggling franchise. Hutton had a .936 save percentage during the Sabres' 10-game winning streak in November, only to enter Thursday with a mark of .908 – his lowest since an 18-game stint with Nashville in 2014-15. Still, Hutton should reach his goal of appearing in 50 games this season and established himself as a leader in the dressing room. Though the Sabres entered Wednesday's games 28th in the NHL and amid an eight-game winless skid, Hutton expressed optimism for the franchise's future. The Buffalo News caught up with Hutton to discuss his decision to sign with the Sabres, playing for a young team and his outlook for the future. BN: With the way the season has gone, do you still believe signing with the Sabres was the right fit for you at this point in your career? CH: At times it's been hard. I could have gone somewhere and been more protected, but I wanted to play more and I wanted to compete. I wanted to be part of turning this thing around. Obviously, we took a good step forward, but I'm not done here. We have a lot of work to do, and I'm excited for the future for sure. Obviously we're going to finish strong here and hopefully we can finish with a couple of wins. BN: When you signed with Buffalo, did you expect a young team such as this could potentially give up so many scoring chances? CH: I knew what I was coming from was going to be different, for sure. I guess it's been unpredictable. I've had to alter my game a little bit because of that, but it is what it is. That's part of the growing pains of a younger team. For the most part, I went from being the average age on my last team to one of the really older guys, right? It's definitely been a change of pace in that sense. BN: How did you alter your game? CH: I thought, when I played in St. Louis, I was a little more conservative because it was a lot more predictable. We didn't really give up a whole heck of a lot. You had to make your three to four quality saves a game and the rest was predictable. A lot of outside shots. We had a veteran defensive corps and veteran forwards who really knew how to stay structured in the D zone, where here I have to keep more momentum in my game because we do give up a lot more secondary chances and seam passes. I've had to be quicker on my feet. It's a happy medium. You still need that conservativeness because that's my strength, but I do have the athletic ability to make secondary saves. I guess it's been a feeling-out process. You can kind of sense the way the game is going for us. BN: Was there a certain point in the season when you realized you needed to change your game, or did you quickly come to that conclusion from the start? CH: Not necessarily. Even early, I think the game has been pretty consistent for us from the start. It got overshadowed a bit because we won a lot of games there and everything was great. At the same time, we were still giving up similar stuff. Personally, I thought at one point I wasn't playing as well as I had, but it's a long year as well. I don't think, by any means, I played bad, but sometimes you get a bad bounce and you're trying to do too much. BN: Did you have a learning curve coming in here as a leader in the dressing room? CH: It's tough. I've always been a vocal leader on teams I've played for and you try to be a good locker room guy, but obviously. this year. I've played a lot more games. Sometimes when you're playing it's more difficult to be the voice in the room in a sense because I need to focus on my job. I have to take care of business and stop pucks. That's the number one issue. I think it's been a fun transition. We have a lot of good, young kids. We have great personnel. At times, it's definitely been frustrating and guys have shown that, but at the same time, we have a good group of guys and we are still young. If you look at it – I know from the outside looking in, it's tough – but at the same time, we've won a lot of games. We're in a better place than last year. If we could tweak a few things here or there. What's done is done. We have to finish strong. For us, moving forward, we have a lot of talent and depth on this team. BN: Even through the difficult moments, you and other veterans have referenced the positive chemistry with this team. What has allowed you to maintain that the past few months? CH: Our older guys do a good job of communicating and keeping the younger guys in line. Misery loves company. I think the biggest thing is when there was anything where guys were negative or anything like that, our older guys and young guys have learned that we need to snuff that out right away. We've tried to stay upbeat and control what we can. It's obviously been a roller coaster of a year, but at the end of the day, we're professional athletes. We get paid to do this and we get paid really well. The criticism and the tough times that come with it are part of becoming a veteran pro. The majority of it is making sure you come to work every day, making sure you are getting better and finding a way to help this team win. We know we have a city that loves us. I know it's been tough at times, but they want to win just like we do. Q: Do you feel good about your game heading into the offseason? CH: It's a tricky year to look at my numbers. I feel like this is a real year for me to find out it's a team sport. You go as the team goes. I think, for me, I've prided myself on giving us a chance to win every night. We talk about the chances – I'm sure we could dive into analytics and you could really get into it – but I know what I bring to the table. I think management does and the guys in our room. I'm just trying to get better. I'm coming on 50 games here, which is what I wanted to do. It's been good. There are obviously games where there are things I want to change and others where I think I was a big difference-maker. I want to continue to bring that, and take this summer to get better and stronger and learn from this year playing this many games. Help this team get into the playoffs next year.